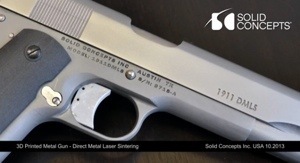 3D printing company Solid Concepts announced it has manufactured the world’s first 3D Printed Metal Gun using a laser sintering process and powdered metals. 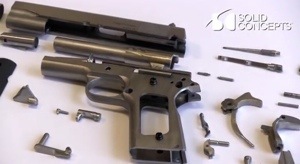 The gun, a 1911 classic design, has already handled 50 rounds of successful firing. It is composed of 33 17-4 Stainless Steel and Inconel 625 components, and decked with a Selective Laser Sintered (SLS) carbon-fiber filled nylon hand grip. This entry was posted in 3D Printing, Manufacturing Technology, materials and tagged Gun by Sci Fi Engineer. Bookmark the permalink.